DangerousMagnets - C10015__Diam 10mm x 1.5mm. N45. Qty36 for sale! The following shipping options are available. $12.00 Courier. All Fastway Rural Delivery, incl Auck. $50.00 PO Boxes, i.e. DON'T! Courier cannot deliver. • 10mm diameter x 1.5mm thick. • Poles on flat faces. • Pull/Push: About 1kg to another magnet or to 1mm sheet steel. Resistance to sliding is about 1/3 that. Stack 2 for twice the pull. • One magnet holds about 5 sheets of copier paper on a whiteboard. • About 10 times more pull than the traditional, grey, ferrite type. • Neodymium magnets never weaken with age. • Triple plated for durability: Ni/Cu/Ni. • Attaching documents, photos and products for display. For easier finger grip, use thicker magnets. • Secure display of work-site design drawings. • Sewn into curtain seams to hold them together or to steel. • Not for kids! Two or more, if swallowed, can lethally puncture gut tissue. • They can pinch skin and cut clothing. • The material is brittle. It can chip or break during collisions. Eye protection advised. • For credit cards, pacemakers etc, keep at a distance where the field is negligible. • Genuine NZ trader in Auckland, trading with scrupulous honesty, specialising in Neodymium Magnets since 2009. • Unequalled 5000+ positive feedback for magnet sales in Trademe. 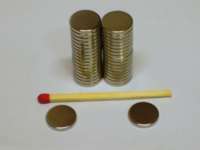 • I don't sell China's cheapest neodymium magnets. I have found them substandard and with fake "certification". • Qualified mechanical engineer with decades of practical experience. • I am happy to help you find the best solution for your application. • Visits welcome by appointment. Bring your application to investigate solutions. • You're welcome to change your order to 2 half-packs &/or add half-packs. Just ask. • Quantity discounts. Please ask.